[London, UK, November 15, 2017] Imagine a world where wireless infrastructure is no longer confined to the ground by the limits of gravity. This was one of the hot topics at the 8th Global Mobile Broadband Forum (MBBF) hosted by Huawei, GSMA and GT, which kicked off in London today. The MBBF this year was attended by 1,400 industry insiders, including representatives from mobile telecom operators, vertical industries, standards organizations, and industrial alliances. This year’s MBBF topic was about change, and the attendees gathered to discuss how “Mobile Reshapes the World”. Huawei Wireless X Labs unveiled the "Digital Sky Initiative" – an initiative designed to develop the low airspace economy through advanced application of drones. By taking network coverage to the low airspace (within the 300-meter range), the digital airspace in cities will soon undergo a transformation, as intelligent data traffic management in the air becomes a reality. Current low airspace drones are supported by reflected signals and side lobe coverage, and interference is a major challenge. 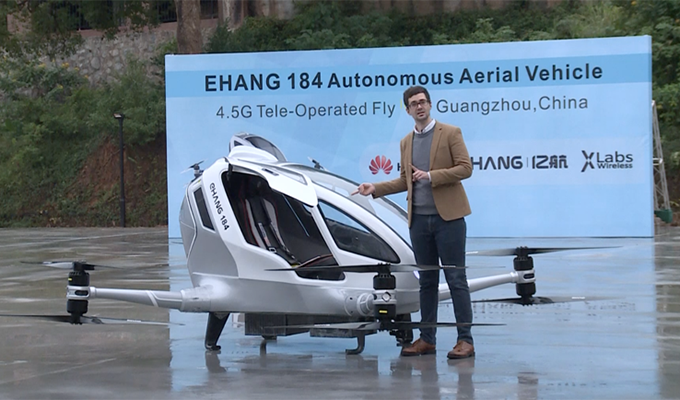 However, guests at the MBBF watched a live video feed of EHang's “Flying Taxi” – the EHang 184 Autonomous Aerial Vehicle (AAV) – that broke through this limitation. By harnessing advanced 4.5G network support on the EHang 184 AAV, the drone safely completed a 200-meter flight path, achieving non-line-of-sight (NLOS) flight control and data transmission based flight management. Cellular-network-based drone management will continue to see breakthroughs, as deployment takes advantage of ultra-large bandwidth, extremely low latency, high reliability, wide coverage, and other advancements currently under development with next-generation 5G networks. Huawei’s Digital Sky Initiative was established to usher in these developments and applications. The world is already beginning to see the first successes of the Initiative. In October 2017, the world’s first Digital Sky Hub was founded in Shanghai to encourage joint efforts including EHang in creating drone application demo sites. In 2018, more hubs will be set up in Europe, Canada, Korean, and other locations around the world. 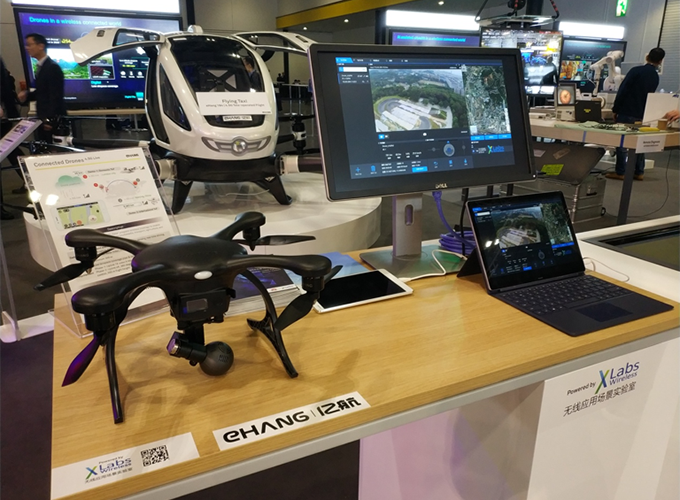 The future is bright for collaboration, and EHang showcased several cutting-edge IoT-based connected drones and application scenarios. Some of the products featured that will be instrumental in bringing in the future of low air-space drone applications include the EHang GHOSTDRONE 2.0 Plus – a smart drone with remote control and aerial shooting live broadcast capabilities across the 4.5G network. 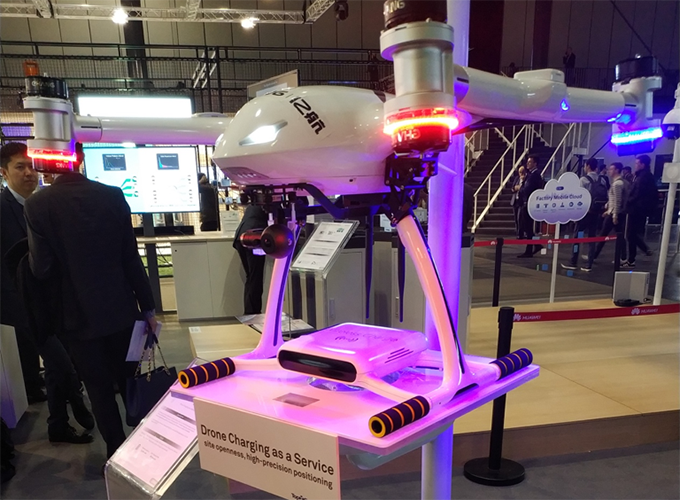 The EHang Falcon commercial drone with wireless charging capabilities at Huawei base stations. •IoT-based Control: Cellular networking extends the flight distance of UAVs in control and data exchange to enable remote ground-air interaction. •IoT-based Data Interaction: Breaking the traditional closed-loop data interaction between the drone and ground control side. Direct connection from drones to the Internet fully enables IoT drone applications. •IoT-based Data Processing: Real-time online data collecting and analysis from the drone right to the cloud. With the expected release of 5G, connected drones will evolve into intelligent applications, enabling new capabilities such as intelligent logistics, intelligent security and intelligent transport in space, and open the digital world to the skies.